Both commands finish successfully. I opened the two pdf files using adobe reader and examined their properties: Each pdf file contains the embedded optical sizes (caption, regular, subhead, ...). If I open the pdf files using adobe acrobat and highlight a letter or a word, the tool column (edit/insert text) shows the highlighted letters' fontname, where the difference gets obvious: The pdf compiled with XeLaTeX shows the correct fontname, including optical sizes. The pdf compiled with LuaLaTeX shows "regular" for all letters. The pdf resulting from XeLaTeX seems fine. Is it possible that LuaLaTeX just embeds the optical sizes (e.g. updates the pdf-internal font list), but uses only the font's regular size? Note: I cleaned (removed all files) from the luatex-cache (C:\texlive\2014\texmf-var\luatex-cache), before I produced the above screenshots. 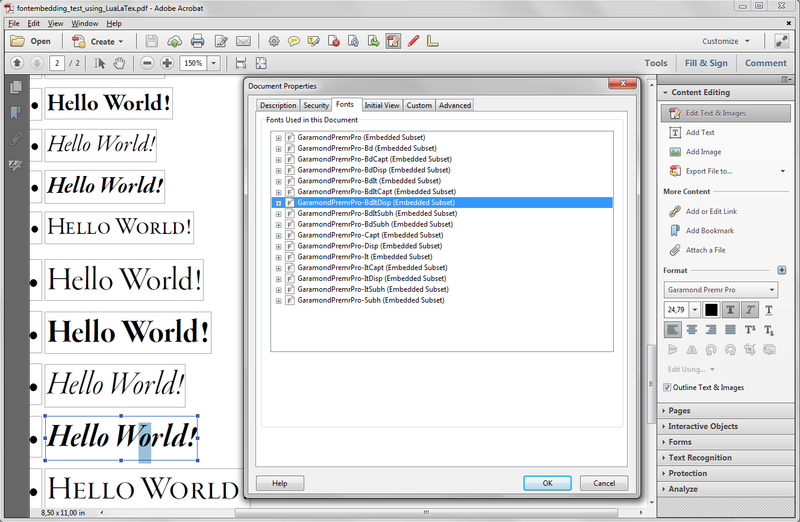 Is there a way to use different local font files for different font size in fontspec? Optical font sizes: how do I set a fixed value? Does XeLaTeX automatically select optical sizes for a given font, if available? 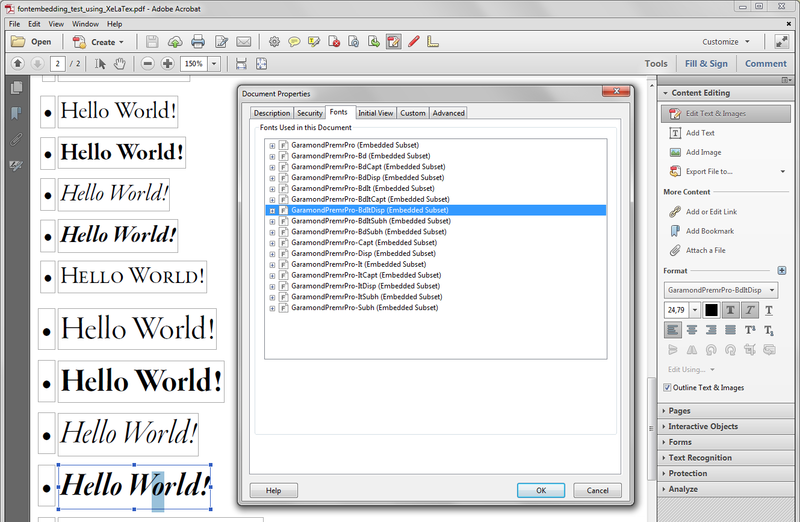 How to get proper placed closing German doublequotes using lua|xelatex and Garamond Premier Pro Opticals (Regular)?